One of the fastest growing trends in exercise recovery therapy is whole body cryotherapy, or WBC. With cryo franchises popping up everywhere, athletes and fitness enthusiasts alike are lining up to freeze away pain and inflammation after a tough workout or sporting event. 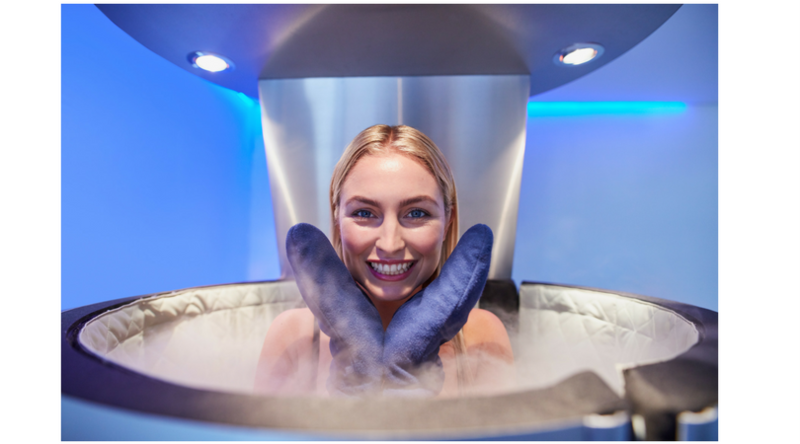 Olympians and professional athletes regularly use cryotherapy to promote muscle recovery so they can return to play quickly and perform pain-free. At $35 to $90 dollars for a 3-minute cryotherapy session, you may wonder whether WBC lives up to its hype, and if so, what are the mechanisms behind its healing properties? After intense exercise, micro tears in muscle tissue cause pain and inflammation, a condition known as delayed onset muscle soreness, or DOMS. When muscle tissue is damaged, an enzyme called creatine kinase (CK) leaks out of injured muscle cells and circulates in the bloodstream. Three studies, Gill et al., 2006, Banfi et al., 2007, and Wozniak, et al., 2007, measured CK levels in athletes immediately post-workout and again after a cryotherapy session They compared results with a control group who also worked out but had passive recovery. All three studies reported that cryotherapy significantly decreased levels of creatine kinase compared to passive recovery. The results suggest that cryotherapy may facilitate muscle fiber repair, enhancing recovery. Another study, Purnot et al., 2011, measured blood markers of inflammation called cytokines in runners. Measurements were taken immediately post-workout and 96 hours later, and researchers then compared blood samples from athletes using WBC to those using passive recovery. They found that WBC significantly decreased inflammatory cytokines and increased anti-inflammatory cytokines compared to passive recovery. The results suggest that WBC reduces inflammation associated with exercise-induced muscle damage. The concept of cryotherapy to reduce pain and promote healing is nothing new. The ancient Egyptians used cryotherapy as early as 2500 BCE, and it has been used ever since to treat injuries and control pain, bleeding and inflammation. Elite athletes have been know to soak in an ice bath at temperatures around 50º for 10 to 20 minutes after a game or event, enduring discomfort in the interest of speedy recovery. By comparison, WBC is much quicker than ice bathing, and discomfort is minimal. 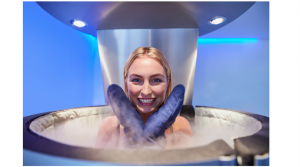 The procedure uses a cryochamber cooled by liquid nitrogen to temperatures dropping as low as -274º F. A session lasts only a scant three minutes, during which time the top layers of skin drop to freezing, shunting blood and fluids away from the skin’s surface. Excess fluids and toxins are delivered to the lymphatic system to be eliminated, while red blood cells circulate among internal organs to maintain them at optimal core temperature. As the body warms, nutrient-rich oxygen-saturated blood returns to the skin and muscles, nourishing and replenishing cells and promoting new cell generation. WBC has also been shown to reduce stress-induced chronic inflammation, a condition that can lead to serious metabolic disorders and cause premature aging. WBC activates the parasympathetic nervous system, releasing calming hormones that combat stress and reduce inflammation. After a WBC session, users often report a feeling of endorphin-induced euphoria. Whether you are training the next American Ninja Warrior or doing balance training with older adults, the fundamental principle of fitness are foundational to safety and results. Staying abreast of trends and new research in sports and exercise is your responsibility as a fitness professional. Get certified with Personal Fitness Trainer, Older Adult Fitness Specialist, Lifestyle Fitness Coach, or Youth Fitness. Then back up your knowledge with continuing education. Extreme training calls for extreme knowledge, and W.I.T.S. has the courses you need to stay informed. Previous post: Warrior Fitness Training: Transient Trend or the New Face of Fitness? Next post: Cupping Therapy for Muscle Recovery: What is It, How Does It Work, and Is It Right for You? I did a huge workout a couple days ago and it still hasn’t stopped aching. It makes sense that cryotherapy could help! I would love for any chance to get this pain away.